As I started reviewing all my stats and numbers from last year, I decided to share my findings in this post. A lot happened last year and I want to be able to document everything for future findings. The biggest impact was signing up and taking Elite Blog Academy. This amount only includes money that was put in my bank account. So even though I made money in December, I wasn't paid for it until January or later, so I don't count it. Blogging has changed my life so much! I know it sounds corny, but I still can't believe how many great things have happened since I started this blog. Seriously, the fact that I could make over $13,000 in such a fast amount of time – while working part time from home – is crazy! I've also made some great online friendships from fellow bloggers, and can't wait to meet some of these friends in person when I go to my first conference later this year. If you have been thinking about starting a blog, stop thinking about and just do it. If you are thinking about starting a blog, this tutorial will help you start a blog today. You’ll also get a FREE domain name for a year! I was able to quit my job and blog full time, all within my first year of blogging. I am really glad I took a chance and started a blog! 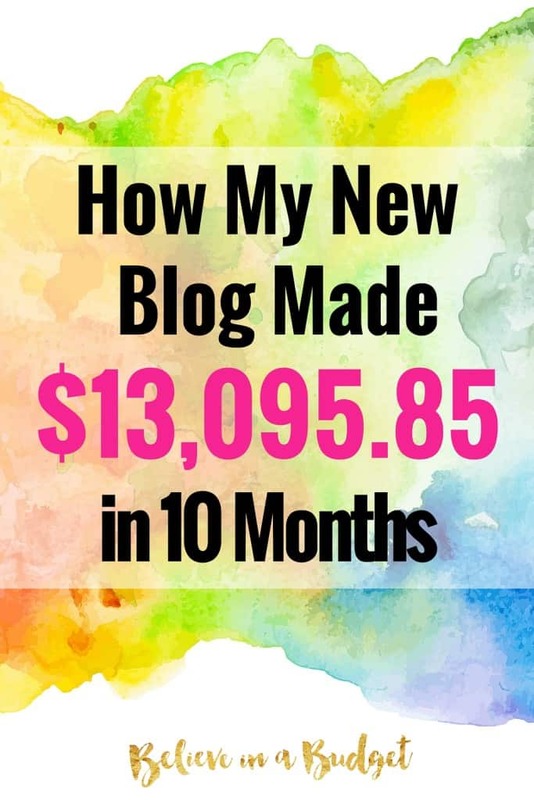 I invested around $100 to start my blog using Bluehost, and I made $13,000 in 6 months of blogging. That’s the best return of investment ever! If you want to get on the waiting list for EBA, you can sign up here. EBA usually only opens once a year in February, so enrollment is limited. The nice thing is when you sign up ahead of time, you receive a few free goodies on blogging that are super helpful! You definitely need to get on the list if you are a new blogger and it doesn't matter what time of the year you sign up for the list. To read my in-depth review of Elite Blog Academy, I wrote this review 12 months after taking the course so I could give honest feedback. I also answered a lot of common questions I received about the course as well! I had my first online income report in April 2015. Technically, I received this amount over the course of 10 months, so I earned this in less than a year! I worked with Google Adsense and Media.net. It took me MONTHS to get that first paycheck and reach the $100 minimum threshold. It was also the most rewarding $100 check I ever earned! One of the best ad companies I like is Cooperatize. They are one of the few agencies that accepts bloggers with all different monthly page views, so they are worth checking out and getting signed up with! Even though I was accepted into other agencies, nothing really came of it. Some agencies have the mantra “we'll contact YOU if something becomes available.” Other agencies had some stiff competition and I wasn't selected. Some companies wanted you to bid on an insanely low campaign that literally paid a few dollars, which is something I refused to do. I was a little disappointed with the amount of time and energy I put towards some of these companies. Nothing annoys me more when I have to share all my Google Analytics, add some code to my website per the company's request and give out personal information, only for nothing to happen. While things did start changing once I hit the 100,000 pageview mark and I now get more and more offers for sponsored posts, I probably should have invested my time elsewhere before crossing this threshold. I personally wasn't comfortable reaching out to brands until I reached the 100,000 page views within a 30 day succession. I think you can absolutely reach out to brands before this, but it was a personal goal to reach this number. I also did not want to participate in any giveaways or product reviews, as my blog isn't really like this. While I made no money from working with brands last year, I did put the wheels in motion in December to line up sponsored posts for the new year! I also created my media kit around the same time I was contacting companies, so I was pretty busy trying to get everything done. I'm thinking about creating a .pdf or freebie on how to do a media kit – would anyone be interested? It can take time to work with a brand – there's the initial email and possible follow-ups, communication back and forth, creating a contract and agreeing on a price, setting a deadline and getting to the actual publish date. I didn't release my first product until January of this year, but spent most of my free time writing and editing in November and December. I am including this anyways because I want to remember how much time I put into the writing process. I went through phases writing my book – sometimes I could sit for an entire day and bang it out – sometimes I had a week gap in between writing sessions because of time constraints. Initially, I thought writing the book was the hardest part. Nope, turns out editing was harder. And then promoting was even harder. After it was all said and done, I'll never complain about the writing process again! This area of income has become my favorite way of earning money. This is an area I should have started utilizing when I first started blogging. At first I was uncomfortable writing about products I enjoyed using. I was worried readers wouldn't like that I could earn a referral for writing about a favorite product that helped me blog (even though it doesn't cost the reader anything extra!) But as I read other blogs, I appreciated bloggers sharing tips and tutorials. Affiliate income is the easiest way to say thank you to a blogger for providing valuable information. If all I had to do was click on their link and they could earn income while helping me solve a problem, I could do this for my readers! The best luck I've had with major affiliate companies is Shareasale. Many of the companies they have partnered with are brands I already use, so it was a perfect fit. Wow, I'm so happy with this number. I earned this income while working around my full time job. Fortunately, I was able to quit my job and this includes two months of full time freelance income. Freelance income (or anything else on this list) wasn't even on my radar a year ago. I am so excited by my accomplishments and can't wait to see what is in store for this year. Anything is possible! As someone who didn't know how to do anything, let me tell you – anyone can start a blog, work hard at it and see results! If you want to get on the waiting list for EBA, you can sign up here. EBA usually only opens once a year in February for a week, so enrollment is limited. You definitely need to get on the list if you are a new blogger! 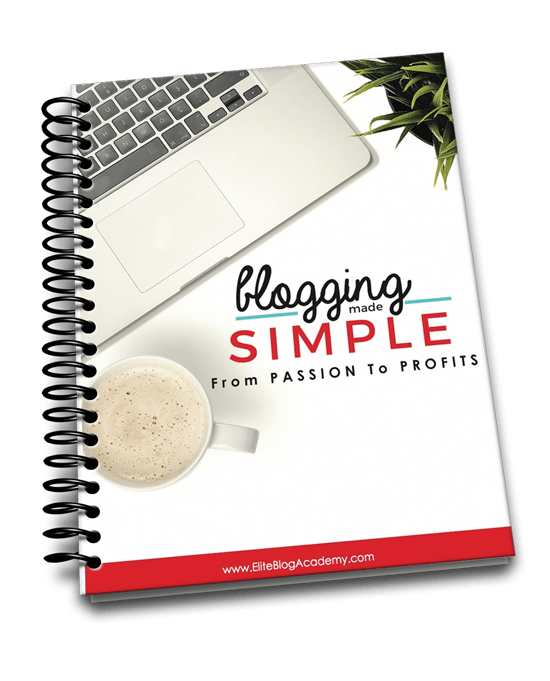 You can also sign up and get this free ebook and video tutorial on how to get started with your blog and start making a profit. Ebates is my absolute favorite company to use when I’m shopping online. Hello, it’s free money! Every time I shop online, I always start at Ebates. They have a list of all the places you normally shop at and you just click on the store you want to visit online. After you make a purchase, you earn a percentage of the sale! They literally give you cash back on every purchase you make. The cash back ranges from 1% to 14%. The money is then deposited into your PayPal account. I’ve made over $700 from shopping online and earning cash back. Join Ebates here! This cell phone app helps you make money off your grocery receipts. Yup, for real! You use it after you go grocery shopping and use your receipt. It’s basically a rebate app, so you can earn anywhere from 50 cents to $5 off everything you buy. My favorite part about Ibotta is that it’s not always brand specific, like a lot of coupons are. So you’ll be able to scan “any brand of bread” for 50 cents off, etc. If you do coupon – you can STILL use Ibotta and get a rebate. For the diehard couponers out there, this will often result in getting an item for FREE. When you sign up, you will receive a $10 cash bonus when you make your first scan. Join Ibotta here! I have made thousands of dollars over the past few years from taking surveys online! There are a handful of companies that I love to use and earn cash back into my PayPal account, as well as reward points that I can use at places like Target, Walmart and Macy's. Here is a list of the best survey companies to make money. I went from making $40/month to over $4,000/month in the span of six months. That’s crazy! Here is a tutorial that walks you through how to start a blog. Blogging has totally changed my life. I even share my online income reports so other people can see how I got started and how I am growing. Work your own schedule and make mad cash! I know plenty of drivers that work all kinds of different time shifts, whether it's working during rush hour, happy hour or in the evenings. Uber even offers bonuses and extra incentives all the time. To learn how to become a driver, click here. Whether you want to start an emergency fund or a vacation fund, you have to start setting some money aside. If you’re like most people and struggle with saving, you should consider using Digit or Qapital. Qapital is a totally free app that let's you decide how much money you want to save every time you make a purchase. You can pick from $1 all the way up to $5. So let's say I spend $24.05 at the grocery store. Qapital will then transfer $1 to my savings account. You can link as many debit cards or credit cards as you want to Qapital. So even if you use a credit card to make a purchase, you can pick one bank account to transfer the $1 to your Qapital saving account. Click here to learn more about Qapital. Digit lets you save money each week from your checking account. What I really like about Digit is that it analyzes my bank account and determines how much I can really save per week. Some weeks it might be $5 and other times it might be $20. You don’t have to worry about overdraft and can contribute less or more if you need to. You can learn more about Digit here. The only downside to Digit is they charge $2.99 per month to use their service. I don’t mind the fee though since it’s helping me save money every week. If the fee stressed you out, use Qapital! Over the past couple of years, I have stayed at a handful of AirBnB's and saved a ton of money. I've been able to rent an entire house, condo and apartment instead of a room at a hotel. Have you ever thought about renting out your home for a weekend? You can learn more about how to use AirBnB here. Using the link, you will also get a coupon for $40 off your first stay anywhere! Do you have any questions about Elite Blog Academy? Do you have a blog that shows us how to get hired for freelance gigs? I always find your posts inspiring, I am a newbie in this kind of stuff and I’m hoping to grow my blog and reach a point I’ll make such amounts.